The first step to a successful trim is to wear the appropriate attire. Note the closed toed, sturdy shoes. 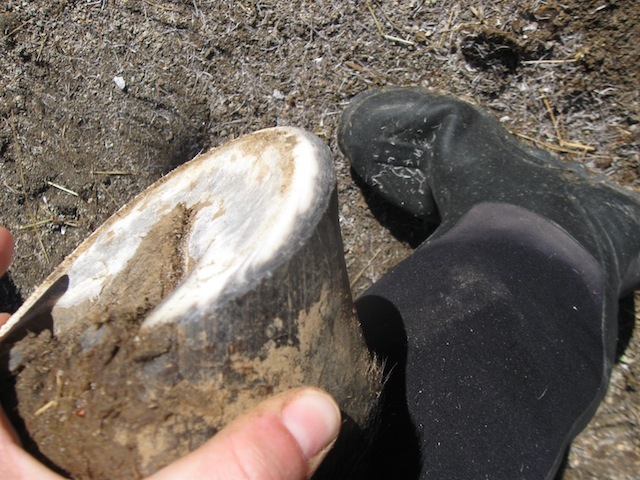 Unlike other pictures posted on this blog, for this hoof trim I made sure my little toesies were protected beyond my typical crocs. The second step to a successful trim is to have the right tools. I’m a huge fan of Save Edge rasps and have used them ever since I started trimming my own horses five years ago. Add a welded hoof stand made from a length of pipe and disc blade, a couple of good knives (I favor Hall brand), and a hoof pick and you have my basic kit. 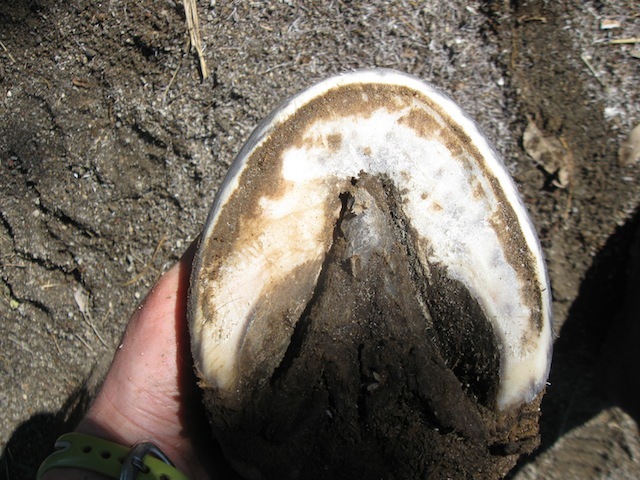 Last year I got brave and started using my hoof nippers ON Farley’s feet instead of just to cutback boots. Less rasping = less sweat = less cursing = better trims. The issue I have with my trims (beyond keeping my knives sharp since I find all sorts of useful things to do with them that are NOT their intended purpose) is creating a nice mustang roll. Finishing from the top and addressing flares is the fun part – trying to start the roll from the bottom is a nightmare. Farley’s feet are HARD in the summertime. Hard enough that I’ve resorted to dremmels and angle grinders to create the roll from the bottom. But they come with their own problems – heat, dust, dead batteries. It takes a minimum of 2 battery packs to do all 4 feet. 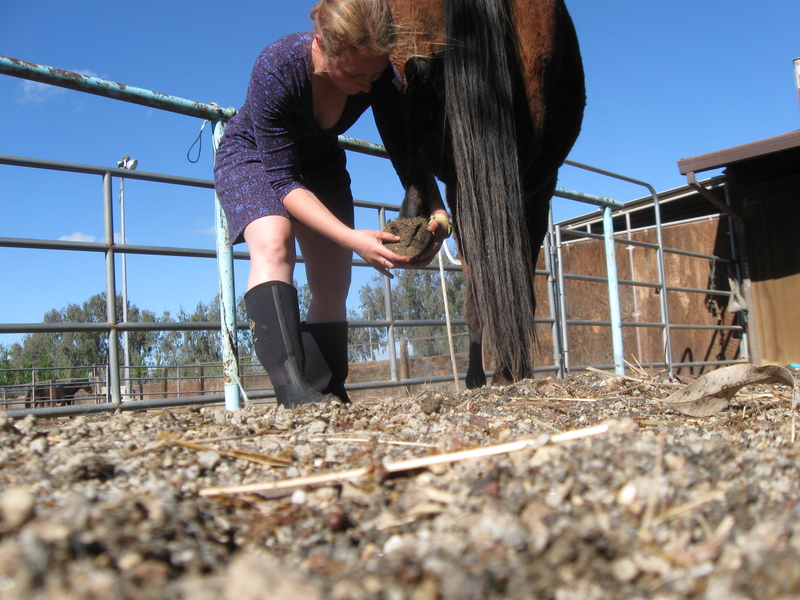 Beyond my own inadequacies, I also realize that it is difficult for everyone to wield a traditional rasp to refresh the mustang roll on hooves between farrier/trimmer visits. 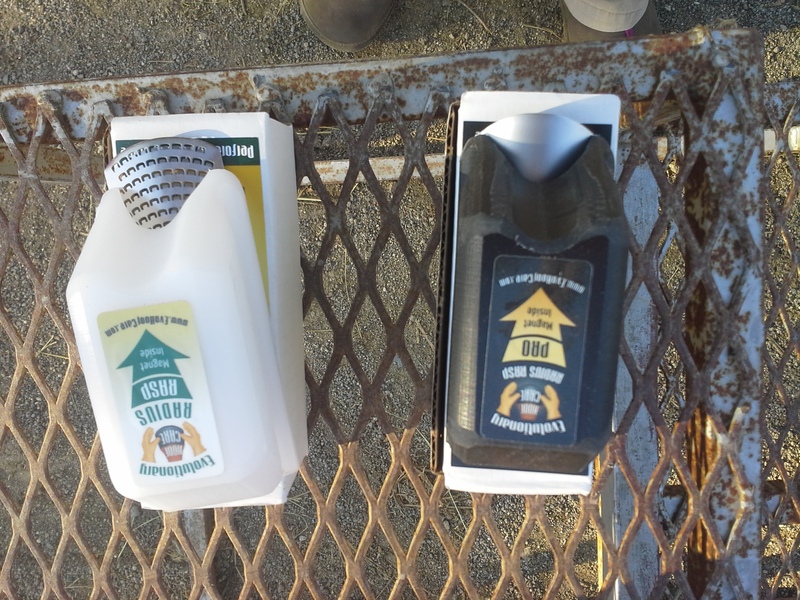 For my boot clients, I’m always on the look out for something that will be intuitive and easy to help them maintain rolls on their horses hooves. I’ve not had good experiences with the other hand held rasp widely available (rider rasp). At the AERC convention in March Evolutionary Hoof Care was there with these rasps. 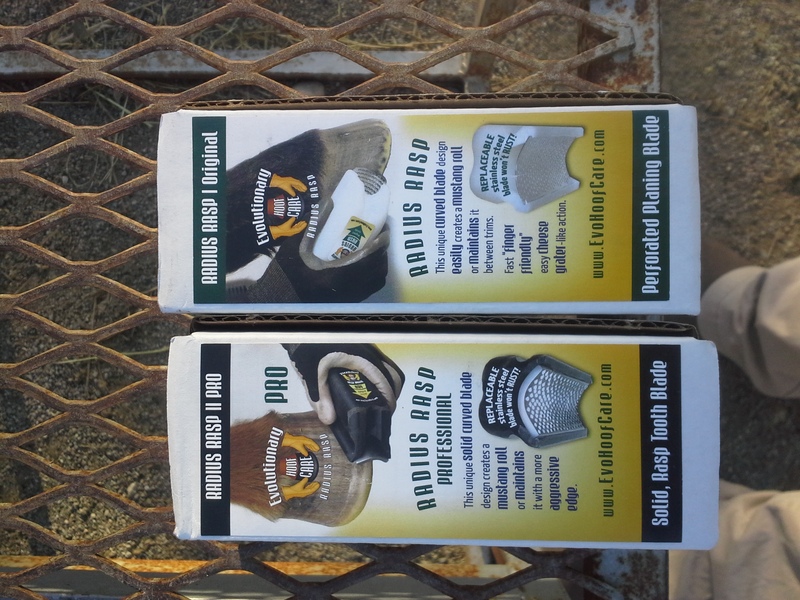 It’s called a “radius rasp” and it comes in 2 textures. The white handled one has a texture and feel sorta like a cheese grater. The black handle is heavier and the rasp is more reminiscent of a traditional rasp – somewhere between the coarse and fine sides on a straight rasp. I was intrigued because these look and feel like “real” tools that actual farriers use. But seemed easy enough for the average boot client to use. And perhaps, it was the answer to my mustang roll woes. 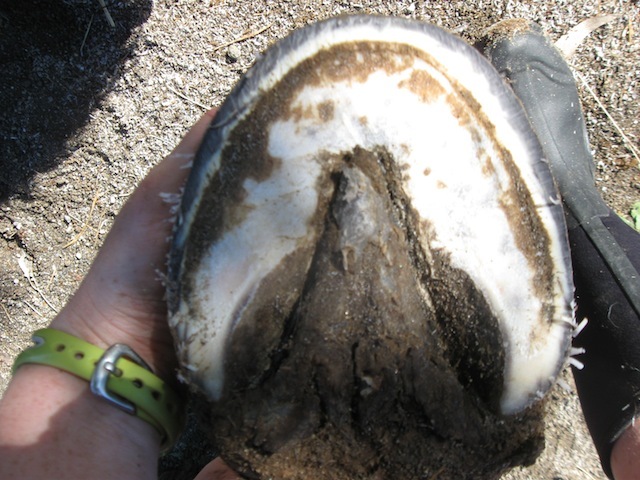 In the interest of full disclosure, Evolutionary Hoof Care gave me both rasps to try and I said I would share my experience with them here on the blog and with clients if I liked them. As I grow older I find myself with less and less patience for reading directions. So the first time I used them I yanked them out of the box and gave it a go. The white one is obviously lighter and for lighter duty but the cheese grater action takes off a surprising amount of hoof. The black one was hard to use at first – it had a lot of bite – but after a couple of hooves, it dulled down a bit and was a bit smoother. I managed to put a good mustang roll on all 4 hooves and then went home to read the directions….and *yawn* decided I didn’t really care. I did make an effort to vary my strokes to use the entire surface of the rasp – not just the middle groove – after reading the manual. There’s all sorts of details about starting the roll with your regular rasp, and then using these radial rasps to blend both from the bottom and the top yada yada yada. But I’ve been using them to create the roll from the bottom and then finishing from the top with my regular rasp and it’s been working just fine for me. A lot of people have asked me if they are only going to buy ONE, which one should they buy? Here’s my 2 cents based on using them for 2 months. Both models have replaceable blades – the white one looks like its easier to pull out the old blade and replace. The black one is going to take some muscle. The white one takes off a surprisingly amount of hoof using short light strokes. 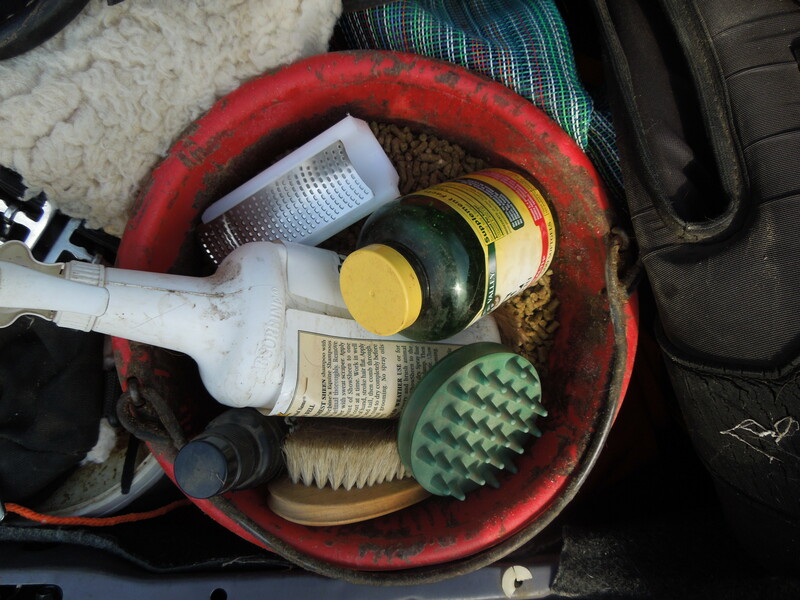 It’s the one I throw in my grooming bucket for rides where I’ll be wearing boots and I might want to touch up a mustang roll (like Derby). It’s designed for finishing and blending so if you use the white rasp for the heavy duty task of creating the roll in the first place, you will probably need to replace the blade more often (and may want to consider the heavier duty black handled rasp). The white rasp was a little easier for me to use right out of the box. 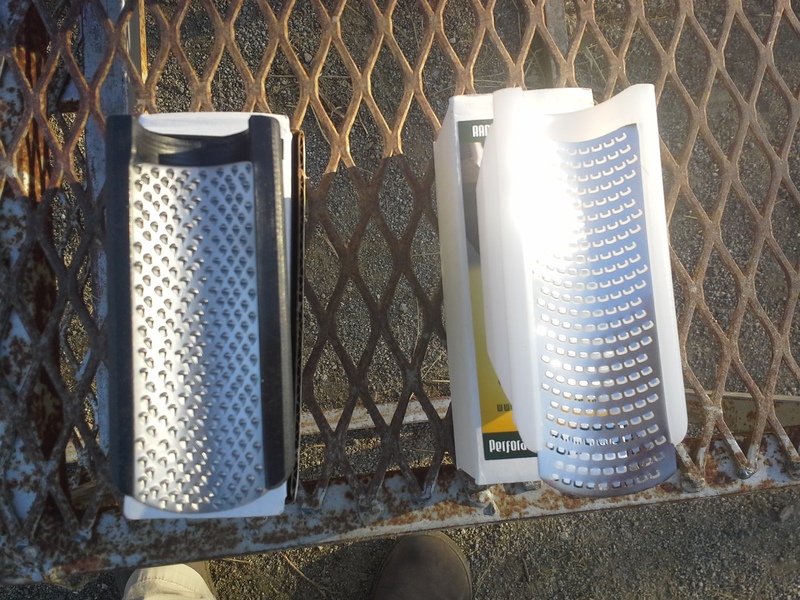 I think if I could only pick one of the 2, and I was half way decent at starting a roll with other tools and just needed something to maintain a mustang roll between trimmer visits….I would buy the white lighter duty rasp. If I wanted something that would create a good roll for all my trims I think the black heavier duty radius rasp is a better choice. It’s easy to take down high spots and get a good roll – but it takes more muscle….but it’s also a more durable rasp if using as part of the regular trim. The 2 rasps aren’t really interchangeable and are meant for different “jobs”, however for my boot clients that don’t regularly trim I would probably recommend the white handled one. For my trimming friends, I would let them demo my two so they can feel the difference and decide for themselves. .
Here’s some examples of the roll it put on some of Farley’s feet. View of the roll from the side. This is BEFORE doing any work from the top. 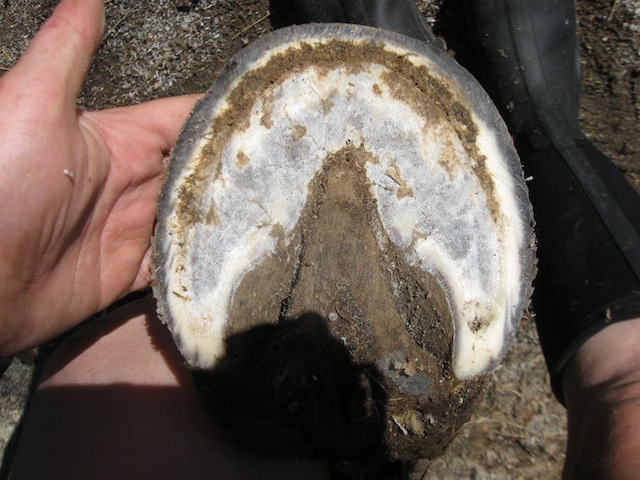 Another hoof – a hind. Before roll. After roll For the pictures above I used a combination of both rasps. My favorite part of these rasps is that I can use them without gloves – I SHOULD wear gloves when trimming but inevitably….don’t. No bloody knuckles! I currently have a pair of pony sized nippers from black diamond. Im not in love with them but ive been able to use them. They are exoensive, but not as expensive as the top models that farriers use (the brand name escapes me right now). Someone long ago suggested pony nippers as a good choice for someone with smaller hands and who find long handles unweildy, and ive found that to be true. As far as sources, i like the horseshoe barn in sac. I ordered rasps from them online and it came fast and packaged with candy :). I’ve also been in there in person and they are wonderful. Aurora orders her rasps from someone in Oregon called valley farrier supply and may be worth checking out for farrier equipment. I got one of the white rasps from them at convention and have been using it…I like it! I do the majority of my trimming still with the regular rasp, but this is a great tool for putting a good roll on the hoof without creating an overly-aggressive, hard-to-boot roll. Overall, do you think its a good *value*? Would you pay $40 plus shipping for one of these? Does it really save on the “sweat equity” of using a regular rasp? The white handled rasp is $40 and replacement blades are $11. In terms of value I think that is entirely up to the individual, but here is how I think if it. This is going to be lengthy, but I want you to know where I’m coming from so it helps you make a decision! I paid close to forty dollars apiece for my right and left handed knives and close to 80 for my loop knife. I spend $100 a year in rasps and make them last until they won’t bite hoof anymore. I paid close to $80 for an angle grinder and another $80 for a dremmel. The cost of the radial rasp isn’t outrageous compared to the other things I have bought over the years that have had varying levels of success. 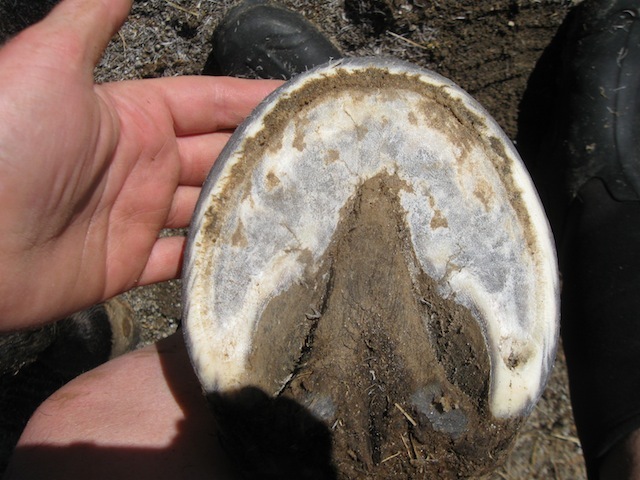 Farley’s hoof walls are thick and tough and during the summer time (dry season) I literally cannot put a mustang roll on the hoof using just a rasp. It’s a stretch to do all four feet in one session even without a mustang roll in the summer.If someone walked up to me in the summer time and offered me 10 bucks a hoof to do a good mustang roll, I might take them up on that. Definiately would take them up on five bucks a hoof! And the rasp and blade lasts longer than two trims. Lastly I’ve made a decision a couple years ago that life is short and I would rather pay a little more and have something be quicker or easier. If I assume that I go through 3 blades a year, plus the cost of the rasp and I’m a bad girl and only trim once a month, then that is five dollars a month for the first year and three dollars a month if I’m just buying blades. I’ll go through my equipment faster with two horses instead of one, but again the alternative is $80 ever six weeks. Even buying myself “luxury equipment” it’s cheaper to do it for myself. And it will be easier and more fun if I have tools to work with that I enjoy. The feedback I’ve gotten consistently over the years when people like Ashley or renegade look at pictures of Farley’s feet is that I need a better mustang roll. The angle grinder can get it done but not without some risk to me and the horse and it will be a while until Merrylegs let’s me go at her with a Powertool. Thanks for the detailed review. I’ve been curious about these for ages. Its good to have a review from a source I trust. For those of you that are thinking of buying an EVO radial rasp – I am VERY impressed with the reps I’ve been dealing with, and I encourage you to contact them if you have any questions once you get the tool. Ben was able to give me several VERY useful tips like dulling down the black handled rasp so that it was easier to use on the hoof (not so “bite-y”) and that the blade will last longer on the white handled rasp if you use light short strokes – biggest mistake people make is pressing too hard and trying to take too much hoof off with each stroke.